The VIP Art Fair, opening today, will be an experiment in art and capitalism, another step on the virtualization of the art market. Organizers of the online art fair, James Cohan and Co., convinced the established galleries and other art professionals, with a hope to take the entire art fair experience, and put it online. Lots written so far. Edward Winkleman, Magda Sawon, Paddy Johnson, Telegraph… Not an alien 3D virtual reality thing, simple slide through high res images with a reference to the works’ size and artists bios. Not an e-commerce site, no place to enter your credit card. Buying by contacting the galleries directly. Live chat with gallery reps and see price ranges for each work. Access to new globalized collectors from Middle East to China. Online haggling with a sheik or an oligarchs via chat function. Video art to benefit from the online venue. Galleries to show more of their best material even they are oversized. No shipping, no lighting, no insurance etc. etc. What’s new compared to a physical art fair experience? Artworks on display at the booth are replaceable, like a rotating banner ad. Dealers can keep track of all their conversations with collectors. Visitors can “favorite” work or share their collections. You can follow the footsteps of a star curator or a museum director. IM or Skype rights will run you $100 the first two days, $20 after the 2nd day. Since the entry to the fair is via registration, organizers have the most complete list of e-mails anywhere in the art world, as well as the wealth of data (from personal preferences to buying history) at their disposal from their server logs. All roles fulfilled, all material experience virtualized. Soon all galleries and art fairs will want such a virtualized organ. Virtualization will lead to multiplication elsewhere. 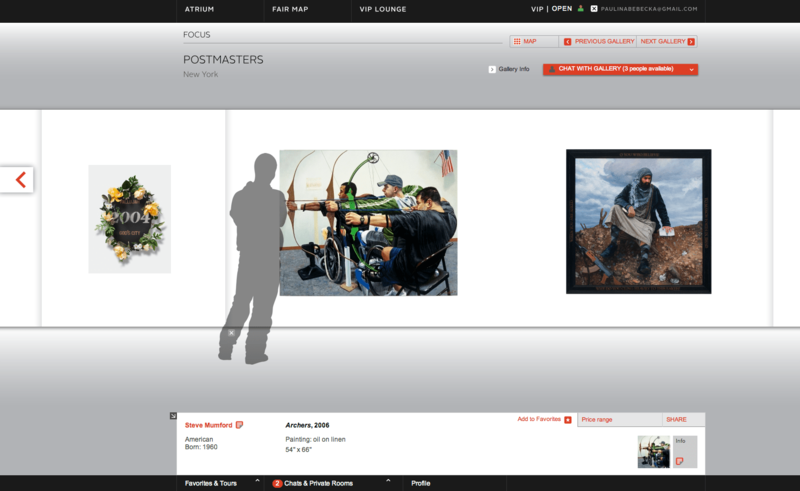 Online socialization and virtualized computation will aid the gallery startup in the cloud. Art market will turn into a massively multiplayer online thing. Biennales turn into continuales. Disruption happens, paradigms shift. After all, this is romantic. I think about Alexei Shulgin’s Form Art Competition. Olia Lialina’s Will-n-Testament. Heath Bunting’s Documenta X. Ubermorgen’s Amazon Noir. Runme. Openstudio. Meta-Markets. Software artists. Hacktivists. We are now in a post-hypertext world. Bimonthly updates about new work, upcoming shows, and talks.